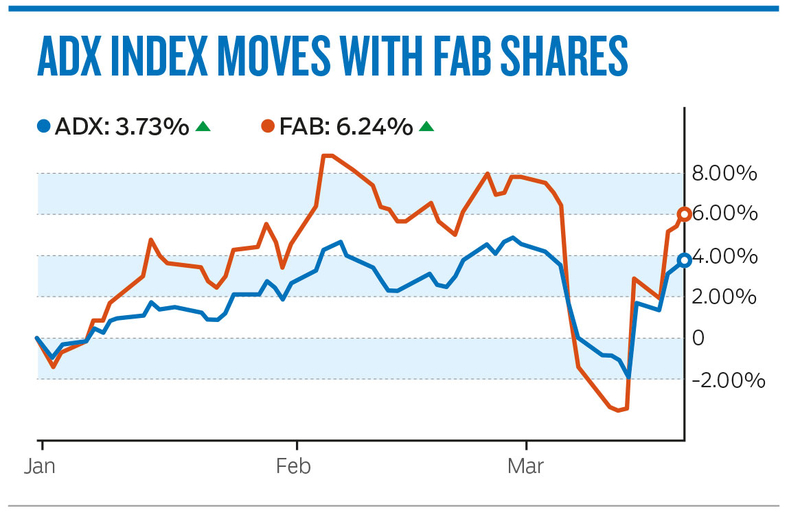 Dubai: First Abu Dhabi Bank (FAB) jumped to its highest level in two weeks, aiding the Abu Dhabi index. 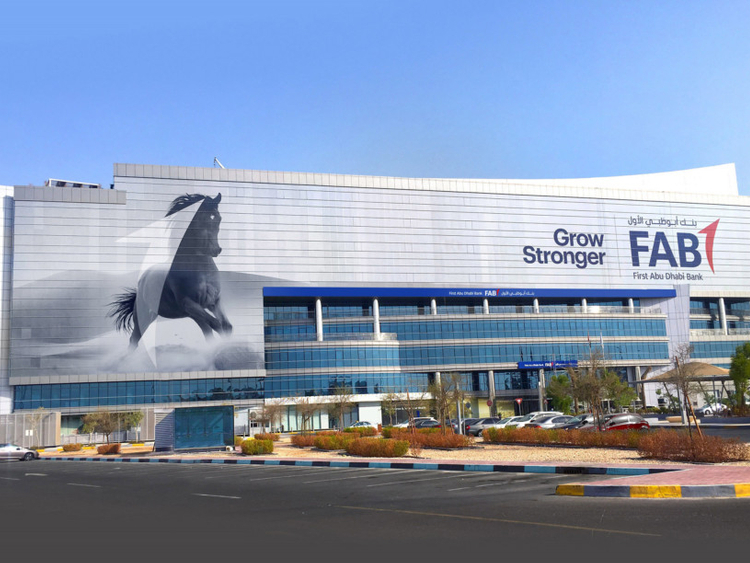 FAB closed 0.81 per cent higher at Dh14.98, after hitting a high of Dh15, the highest level since March 3. The Abu Dhabi Securities Exchange general index closed 0.37 per cent higher at 5,098.32. In other stocks, Abu Dhabi Islamic Bank closed 1.73 per cent lower at Dh4.54. Aldar Properties ended 1.56 per cent higher at Dh1.89. Union National Bank closed flat at Dh5.50. “Investors are looking towards Union National Bank now as they realise it could be a better deal to convert their UNB stock to ADCB post-merger rather than jump into slightly expensive ADCB shares that have risen significantly since the merger announcement,” said Issam Kassabieh, Senior Financial Analyst at Menacorp. Dana Gas closed 0.87 per cent lower at Dh0.91. “Eyes are also on Dana Gas which can benefit greatly from maintaining a 4 per cent profit rate on its Nile Sukuk and can benefit furthermore from a share buy-back programme that supports the company’s vision for the next 5-10 years especially as it pays dividends,” Kassabieh said. The Dubai Financial Market general index stayed in familiar range, resulting in a slump in traded value. The DFM index closed 0.09 per cent higher at 2,643.70. DP World closed 0.88 per cent higher at $16. Emaar Properties closed 1.04 per cent lower at Dh4.77 ahead of the decision on dividend. Emaar Malls fell 2.2 per cent lower at Dh1.78. Dubai Investments closed 1.41 per cent lower at Dh1.40. Emirates Integrated Telecommunications Company ended 2.88 per cent higher at Dh5.350. Traded value fell to Dh126 million on Wednesday. We believe Saudi’s inclusion in the FTSE Russell EM Index will have a significantly positive impact on stock markets. This would result in passive fund flows of about $3 billion. Elsewhere in the Gulf, the Saudi Tadauwl index closed 0.21 per cent lower at 8,640.52 after the gauge was officially added to the FTSE emerging market index. “We believe Saudi’s inclusion in the FTSE Russell EM Index will have a significantly positive impact on stock markets. This would result in passive fund flows of about $3 billion. This event, combined with Saudi’s inclusion in MSCI Inc’s EM Index later this year, puts Saudi Arabia firmly on the radar of international investors and serves to bring the wider region into the mainstream of emerging market investment,” Salah Shamma, Head of Investment, MENA, at Franklin Templeton Emerging Markets Equity, said. Franklin Templeton said they have a clear preference for domestically driven companies that will be transformed positively by government policy to unlock their potential.